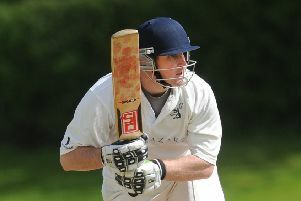 RH Corstorphine took centre stage on the local cricketing scene at the weekend and bounced back from their Masterton Trophy final defeat to beat Stewart’s Melville and secure an eighth CSL Eastern Premier Division win of the summer. Last Thursday evening the East Barnton Avenue men had a chance to win the Masterton T20 event at Grange Loan, but eventually ran out of steam and lost to Carlton by 28 runs. During the match they lost Richard McCorkell and Elliot Foster to injury, while it had been confirmed earlier that their professional Hammad Azam would not play for them again due to a knee injury. As a result, they may have been down in the dumps heading into Saturday’s home league clash with Stewart’s Melville, especially when the morning rain that scuppered a lot of other cricket in the country came along. Not a bit of it, though. This Corstorphine side have impressed many since promotion to the top flight this term and this was a chance to cement a top-half place with a month of the season still to go. Their visitors, starting the day second bottom, were also keen to play knowing that a positive result would likely take them further away from Glenrothes in the relegation spot. The two sides waited patiently to get proceedings under way and the umpires decided that things had sufficiently dried up to get going at 4.10pm with a 25-overs-side contest. Corstorphine won the toss and decided to bat first, Robert Taylor out early on for a duck off the bowling of visiting pro Shaylen Pillay. Overseas amateur Jacob Wood had been promoted to open the batting and made a nice 20 before he was out to Adam McHoul. Sam Flett made 19, Majid Haq 29 and skipper Joe Kinghorn-Gray 32 as they got their side up to 115-5. Some good running from sixth wicket pair Arnie Sathiy (19 not out) and Louis Cox (10 not out) then made sure that Corstorphine got up to a competitive 149-5 from their allotted overs. McHoul and Sam Tait both took two wickets for the Inverleith men. Stewart’s Melville’s reply got off to a bad start when they lost key man Pillay for a duck in the third over. He was caught by Sathiy off the bowling of Wood and when Michael Miller, overseas amateur Hayden Sweet and Greg Bisset fell they were 42-4 in the 11th over. Things only went downhill from there, Corstorphine’s spinners taking charge as Stewart’s Melville were 74 all out. 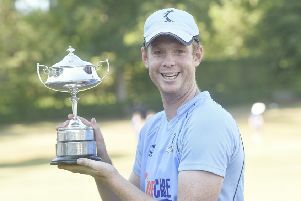 After the 75 run victory, Corstorphine captain Kinghorn-Gray said: “I am really pleased with the boys efforts in this one. “Thursday night in the Masterton was tough to take and we got a couple of injuries, but the guys who stepped up into the team like Arnie and Louis did a great job. “The spinners then showed the qualities that they have to bowl Stewart’s Melville out. “We had a plan coming into this season on how we would compete at this level and to have eight wins by this stage has probably exceeded my expectations. The Carlton-Mazars Grange match was called off in the morning, as was Aberdeenshire-Heriot’s and Glenrothes-Watsonians. Forfarshire defeated Arbroath in the only other top flight clash completed. The poor weather across the country also resulted in yesterday’s national T20 finals day at Poloc called off. Heriot’s were due to be involved and a new date is still to be announced.